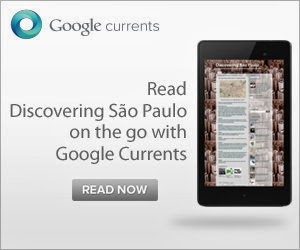 The acronym CGH-SDU is probably familiar to most readers of Discovering São Paulo. Many of us have boarded a plane at Congonhas airport (CGH) and chosen Santos Dumont airport (SDU) as our destination, our carioca neighbours doing the same in reverse. In fact, as surprising as it sounds, with 1,130 commercial flights a week there are no two airports in the world with more aircraft movements, the next closest pair being Melbourne and Sydney with 950 weekly flights. Excluding connection flights if we look at the busiest routes not by plane numbers but by passenger volume (see above) CGH-SDU is knocked off top place by the Seoul-Jeju pairing, Jeju being a small island close to the South Korean capital. But even if the inefficiency of the route means it has proportionally more planes to passengers than other global connections CGH-CDU is still in second place far ahead of Beijing-Shanghai, Cape Town-Johannesburg or Madrid-Barcelona. So what is the reason for such a busy route. The answer lies in multiple factors. The plurality of carriers covering the route is key. In the case of Congonhas to Santos Dumont both high volume low cost carriers such as Gol, the recently taken over Webjet and Avianca run the route as well as the more traditional TAM Airlines. A quick look at the ranking also shows that most pairings with high volumes are major urban areas in close proximity to each other (short haul flights are more common than long haul ones meaning volume is higher). Another factor is the relative importance of the cities which the airport connects. São Paulo and Rio de Janeiro being the top 2 GDP contributing Brazilian cities making the journey a key business route. 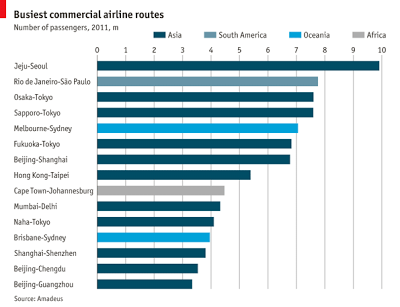 The relatively poorly located and difficulty of reaching alternative airports such as São Paulo’s larger but more isolated Guarulhos/Cumbica or the Tom Jobim/Galeão in Rio also drives airlines and passengers alike to concentrate on “in-city” airports so whilst it is always a “feel good” to head up rankings it is as much driven by poor infrastructure as the importance of the cities themselves. Food for thought next time you catch a CGH to SDU!